When car manufacturers unveil automobiles they usually do it one at a time. Sometimes there’s two or three versions of the same model, depending if it’s offered as a sedan, coupe or convertible. However, I had never heard of a company choosing to debut four all-new, entirely different models at once. Well, at least until last night. Point-in-case Mercedes-Benz. During Super Bowl XLV the German luxury manufacturer showed the world four all-new models: the 2012 CLS-class coupe, SLK-class roadster, C-class coupe and SLS AMG roadster. 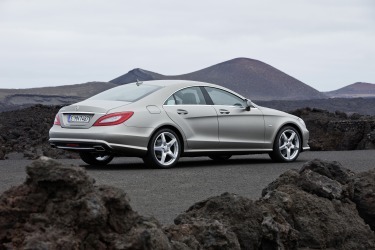 The first car to be debuted is the 2012 CLS-class coupe. Wait a minute, coupe? To me a “coupe” is a vehicle with only two doors, as opposed to a sedan which has four. But there’s a problem, the CLS coupe has four doors. The reason for this is because, according to Mercedes-Benz, the CLS-class is classified as a “four-door sedan.” One of the first changes an individual will notice on the new 2012 CLS-class will be its headlights. It’s the first vehicle to offer full LED capability on all of its head and taillights. The improvements also extend to the interior. The stitched leather dashboard now covers the entire length of the vehicle, from the driver’s side door to the passengers. In addition to the exterior and interior changes, the engine is completely new to the 2012 CLS-class. The 2012 model features a 402 horsepower twin-turbo V8 engine, as opposed to the 382 hp naturally aspirated V8 engine in the current CLS-class. The SLK-class has also been updated and improved, a lot, for the 2012 model year. There are a number of new design features, including LED daytime running lights. and taillights, much like the 2012 CLS-class. 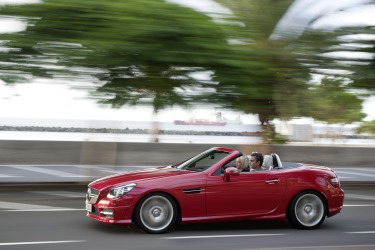 Since the SLK-class is a hardtop convertible the lack of noise and reliability of the hardtop is very important. In order to combat this potential problem Mercedes has developed a hardtop capable of retracting in less than 20 seconds, and with little to no noise. The 2012 SLK-class also has a number of added safety features including “Attention Assist” which alerts the driver if they begin to fall asleep behind the wheel. Another option, the “Distronic Plus” cruise control system, keeps the car at a safe distance from the vehicle in front of it. The last safety feature is the “Pre-Safe” crash detection system. In the event of an eminent crash the vehicle will prepare the vehicle for impact, and will call for assistance following the crash. Along with the 2012 CLS-class and SLK-class, Mercedes-Benz debuted the 2012 C-class and the all-new SLS AMG Roadster.